Spectre, the Sam Mendes(director) follow to the highly successful if not one of the best Bond films out there Skyfall, was released into theatres Nov. 11th worldwide. So I’ll start off by saying that I enjoyed the movie. Overall, I do think the movie could have been better as it wasn’t as thrilling as its predecessors. I’ll start the review with the tradition of the James Bond films with the action sequence to still show that Bond has still got it and their theme song for the movie. Starting off in Mexico during Día de Muertos (English: Day of the dead) festival we find Bond doing what he does best which is playing assassin to another poor sap about to meet his maker while still wooing a woman in the process. The opening scene was a little comedic and kind of ridiculous for an opening. It gave off this tone of humor which can be appreciated by those who enjoy a little chuckle while he blows up half of a building or while endangering an entire area full of people trying to take down his target in an uncontrollable helicopter. The scene kind of reminded me to the intro of Indiana Jones and the Kingdom of the Crystal Skull with Indy and that damn refrigerator. That is a different subject. Let’s get back to Spectre. Next is the opening credits, which visually are always stunning to look at. The movie opens up with Sam Smith’s Writing on the wall. Which is currently playing in the background as I write this article. It’s catchy. I like it. That is all I’ll say about that. Spectre gives us the story of this secret organization that has been under the radar for quite some time. Think Hydra in a way for you Marvel fans. 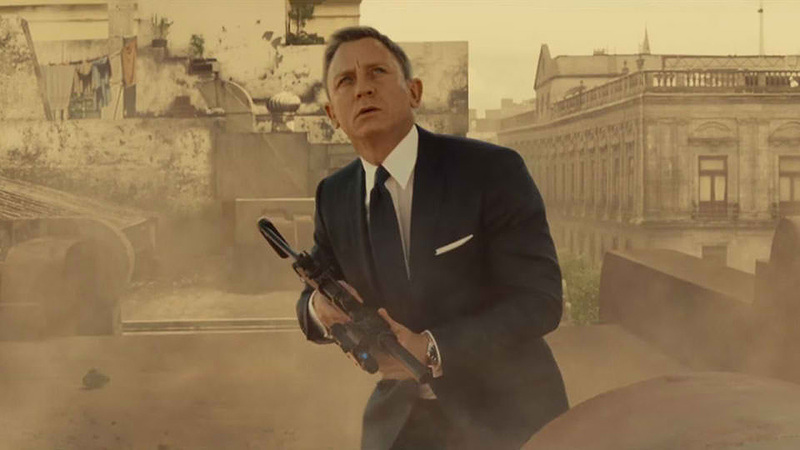 As Bond (Daniel Craig) digs deeper into what this organization is, he finds that he is more connected to it than he had anticipated. The secret group is led by Christopher Waltz, who of course is an amazing actor and definitely had me in chills with his shadow intro from the trailer as well as in the film. Of course your usual characters are back to help and not help along the way. The Boss M (Voldemort Ralph Fiennes), Eve MoneyPenny (Naomie Harris), and trusty tech enthusiast Q (Ben Whishaw). For fans of the Bond films will get a taste of nostalgic in the score, the gadgets, the cars, the women, and the action. If you have been following the Bond films since Daniel Craig’s entrance to the franchise you will definitely get a treat for paying attention to his previous movies. This movie delivers on the locations they shot this film. Every shot was beautiful showing some great structures and views. The explosions and destruction of property whether it’s a wall to a secret room to an entire building were fun and stimulating to look at. It’s funny though, when I watch the film you think you are looking at moving pictures to a GQ or Details magazine with it all being done in the finest menswear out there today. Okay, lets breakdown this movie. I managed to stay up through the whole movie with its action, wit, and little humor. The acting in this movie is great. I like all the actors they have chosen for the film. Ben Whishaw’s Q even got to shine by leaving the lab and having some fun out in the field. I will say that Christopher Waltz’s character Oberhauser was wasted in this movie. His character I didn’t think lived up to the anticipation of what the trailer gave us. His acting ability was definitely not utilized for this role and that’s too bad because he has proven to be a great actor to play a good villain. BUMMER! I do want to give a BIG SHOUT OUT to David Bautista who played the top henchmen Mr. Hinx of the film. You may remember him all covered in colored paint flying in space in Guardians of the Galaxy as Drax. Which gave me a surprise when I saw him because without the makeup and the facial hair he has in the film I didn’t recognize him at first. You know the henchmen in Bond films always get a signature way of attack and his delivers. While speaking only about 2 words in the film minus the grunts and moans he delivered the best performance for me. With his stature and fighting skills, my eyes were glued to the movie with anticipation to his next scene. He definitely gave James Bond a run for his money. The story to me was a bit predictable and cliché’. As the third act and closing scenes played out it reminded me a lot of a certain horror trilogy, I shall not name, to not give away a possible spoiler. I didn’t find it that interesting. I will say though that the film is worth watching for a good action movie and for any fan that have been watching these movies since day 1. So what did you think of the movie? I want to hear your thoughts. Do you agree or disagree with my opinion? Was this review helpful? Leave a comment and be sure to follow me for more reviews on movies and thoughts on movie news. To learn more about how my point system works click here.